Take the survey. We look forward to your feedback. 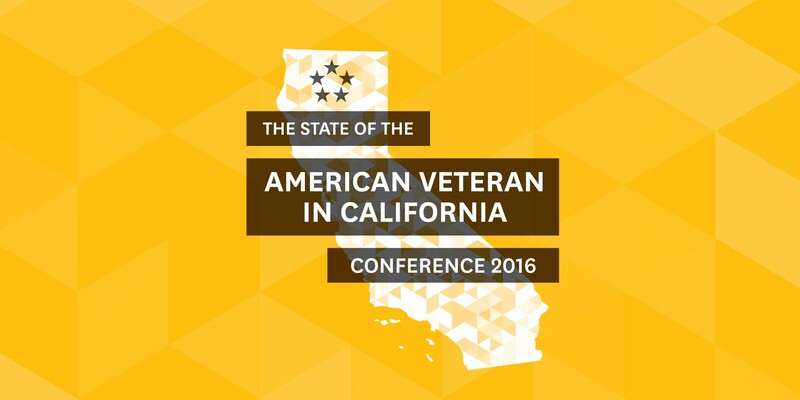 The 2016 State of the American Veteran in California conference was designed to focus on building community capabilities to care for those who have served in the U.S. Armed Forces. California is home to over 1.85 million veterans, making it the #1 largest veteran population of any state (National Center for Veterans Analysis and Statistics, “Veteran Population”). Veterans in California face enormous challenges in the areas of economic security, educational attainment, housing, and behavioral health, despite increases in federal, state, and local funding for veteran services. The foundations of these problems lie in complex systems that cannot be addressed by a single agency or a single intervention alone. The conference brought together over 200 executives, foundations and community leaders throughout the state to work together in addressing the entrenched challenges our veterans face when returning from service. Over the course of two days, we built a foundation for developing new policy, encouraging innovation, and supporting collaboration across the state of California. The State of the American Veteran in California conference provided participants with the opportunity to engage with other leaders working to increase the well-being of our veterans, share ideas, and build new approaches to veteran service. Attendees had the opportunity to participate in one of three unique conference action tracks. Cultivating Innovation to Strengthen Communities: Innovative, community-based solutions are critical to solving problems and leading the way for government and others to follow. Learn about several pilot projects improving the LA veteran community. Fostering Cross-Sector Collaboration: Explore how principles of collective impact have created successful collaboration across disparate agencies. Below please find information regarding the State of the American Veteran studies conducted in Los Angeles, Orange County, and the current study in San Francisco. We are currently in the process of collecting notes from the two-day conference and compiling a report with outcomes and recommendations based on the work done in each of the tracks. Please check back soon to see updates. The State of the American Veteran in California Conference brought together leaders and practitioners in government, business, philanthropy and nonprofit, researchers, and veterans who share a common goal–to develop the capacity of our communities to care for those who have served in the U.S. Armed Forces. This first-ever gathering hosted by the University of Southern California School of Social Work Center for Innovation and Research on Veterans & Military Families (CIR) was designed to explore and design actions to address the most pressing issues facing veterans today. The State of the American Veteran in California was not your typical ‘listen and learn’ conference. Leaders from all sectors–public, private and nonprofit–engaged in strategic conversations leading toward action because the challenges our veterans face cannot be addressed by a single agency or single intervention alone.